There is little else his critics can realistically hope for after Sisi eviscerated his opposition in his first term. In the run up to the March 26-28 election, a succession of would-be candidates were abruptly sidelined like doomed characters in an Agatha Christie novel. “Watch out. That stuff that happened seven or eight years ago (the 2011 democratic uprising) will not happen again in Egypt… it looks like you really don’t know me well. Ha ha,” Sisi said in a January speech after his latest rival, a reserve military general, was detained for announcing his candidacy. Such words play well with Sisi’s supporters, including many Egyptians who have had enough of the turmoil that followed the 2011 uprising that ousted president Hosni Mubarak. A former army chief, Sisi was first elected in 2014, a year after he ousted his bungling predecessor Mohamed Morsi. Morsi was the country’s first freely elected civilian president, but also a divisive Islamist whose policies sparked massive protests. Since then, the country has grappled with a persistent jihadist campaign that killed hundreds, along with long-deferred economic reforms that have resulted in sky-rocketing inflation. “The priority is to fix the situation, and not necessarily according to the traditional standards of a democracy,” said Mostafa El-Feki, a prominent government supporter and head of the Bibliotheca Alexandrina, a major library in Alexandria. But it is difficult to ascertain what most Egyptians believe, given scant independent opinion polls and a domestic media that often touts Sisi’s achievements while underplaying criticism against him. His security services tolerate little outright dissent like that which foreshadowed the 2011 uprising. For now, the opposition — a collection of small parties and groups that hold little sway on the street — is merely trying to “exist,” said Khaled Dawoud, a prominent dissident. Mohamed Anwar Sadat, who withdrew his candidacy in January citing restrictions, said he hoped Sisi would begin democratic reforms in his second term — his last, unless the constitution is amended to allow him more time in power. “It would be a golden opportunity for the president to start dealing with the political file and reforms and look into building real institutions that can fulfil their role,” Sadat said. Sisi faced two heavyweight rivals in the election: former military chief of staff Sami Anan, who was detained, and former premier Ahmed Shafiq. The latter was deported from his exile in the United Arab Emirates after declaring his candidacy, and on his arrival was driven by government officials straight to a hotel where he stayed until he withdrew his candidacy. Another, a military colonel, was jailed for six years for announcing his candidacy while still an officer. The last remaining candidate, Moussa Mostafa Moussa, an ardent Sisi loyalist, entered the race just as it appeared Sisi would embarrassingly have to stand alone in a throwback to referendums held by autocrats. Sadat said Sisi would probably have won even with Shafiq and Anan in the race. But the authorities were not keen on debates. “Perhaps the concern was if there were real candidates there could have been debate on their priorities, there would have been a discussion, and I think they didn’t want one in the current period,” he said. Michael Wahid Hanna, a senior fellow at the Century Foundation think tank, said the government’s approach was “one of zero tolerance”. “The Sisi regime is not going to allow space that could allow political forces to grow and gain confidence,” he said. 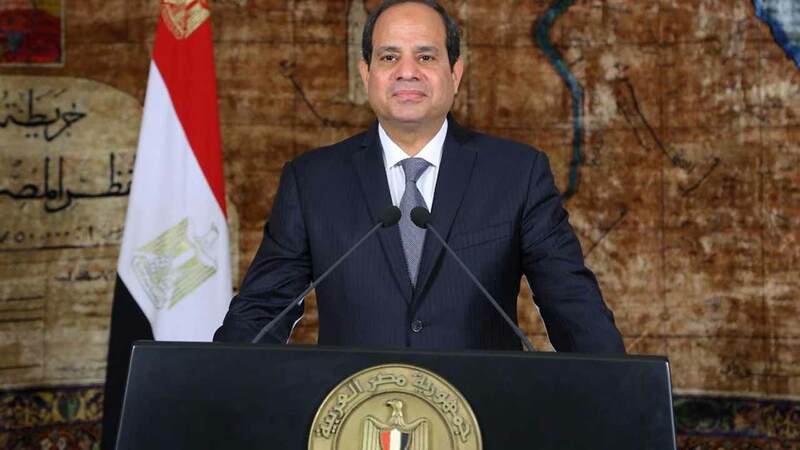 Sisi and his supporters often portray Egypt as a victim of a foreign plot. Its agents, according to this theory, could include anything from Islamic State jihadists to foreign-funded civil society groups or foreign media outlets. Following Morsi’s ouster and a bloody crackdown on his supporters that killed and jailed hundreds, wiping out the Muslim Brotherhood movement as a political force, Washington sanctioned Egypt by temporarily suspending military aid. Such international censure against crackdowns on dissidents or civil society groups have little effect on Sisi, a former Barack Obama administration official said. “They believe the state will collapse,” she said, on condition of anonymity.